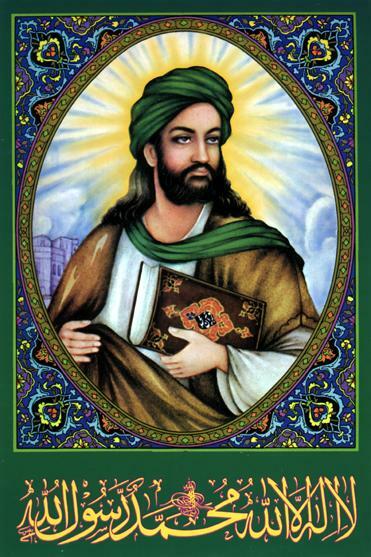 Yes, that green-turbanned man is indeed Mohammed (in most cases), as everyone had suspected all along. The results of all the research, along with several new Mohammed portraits, can now be found here on the Mohammed Image Archive’s “Islamic Depictions of Mohammed in Full” page. In sum: The information contained on this Norwegian-language site at the University of Bergen entitled “Muslimske religiøse populærbilder” (translated into English here) turned out to be much more detailed and scholarly than was at first apparent, and it was confirmed by this video which shows an Iranian Muslim religious shopkeeper definitively identifying the most famous of the “green-turbanned man” icons as being Mohammed. Thanks in particular to Archive reader “Victor O.” for being the first to uncover several of the key links. The one counter-example that turned out to not be Mohammed (the final picture below in this post) is examined in detail at the bottom of the Archive’s new “Not Mohammed” page. And the “Prophet Tree” posters uncovered during this research are presented on the Archive’s new “This Is Mohammed” page. But the remaining portraits originally discussed in this post did indeed turn out to be Mohammed, and not Ali — and during the research process I uncovered several other similar and related portraits of Mohammed as well. All of them are now included in their own section here on the Mohammed Image Archive’s “Islamic Depictions of Mohammed in Full” page. 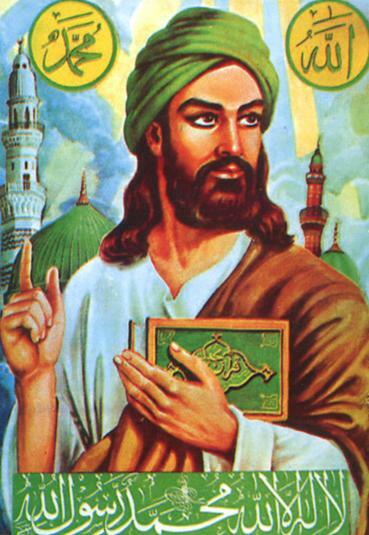 Back in 2006 I posted to zombietime a small collection of historical representations of Mohammed (the 7th-century founder of Islam) and optimistically titled it “The Mohammed Image Archive.” Over time, the Archive did eventually grow to become the world’s largest repository of Mohammed portraits, a status it maintains to this day. Even so, more Mohammeds are drawn and discovered every year, and the Archive has become woefully out-of-date. 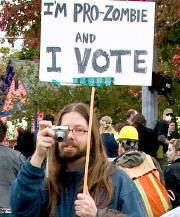 To address this problem, I have recently begun updating the Archive with many corrections and new images. But in the process I have once again come face to face with a mystery that has bothered me for almost a decade: Who is that green-turbanned man? 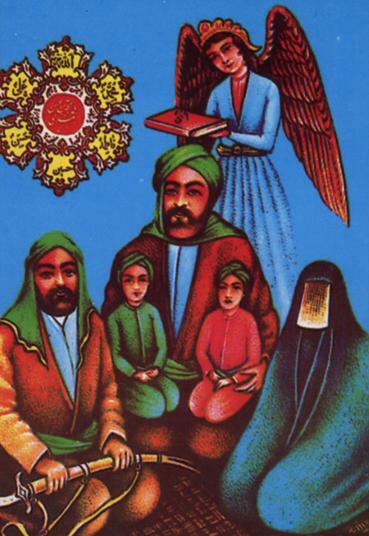 Westerners — that is to say, non-expert random people on the Internet who have used this image in countless satirical Photoshops — took one look at these Iranian icons and instantly just assumed they were portraits of Mohammed. Which they may very well be. 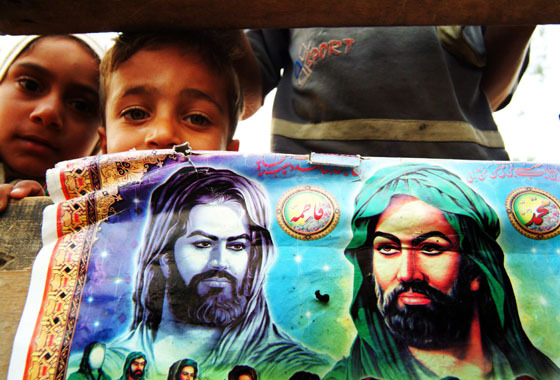 But because Iran is Shi’ite, and the Shi’ite branch of Islam venerates Ali (Mohammed’s younger cousin) almost as much as they do Mohammed himself, I have long wondered whether or not these icons are perhaps actually portraits of Ali, and not portraits of Mohammed. This portrait, however, has additional calligraphy at the top which may help to identify the figure. The inclusion of the shahada in these images is not necessarily evidence that the man is himself Mohammed, even though he is named in it: the phrase is a standard mantra-like declaration of faith that appears on almost every religious artifact in the Muslim world, even ones that have no human figure at all. This photo’s original caption stated that the poster shows the 12 Imams of Shi’ite Islam, starting with Ali (who is also the figure depicted in the larger portraits) and culminating with the hidden “12th Imam,” who is shown with a blank face (because he has not yet appeared). But that only muddies the waters further, because the caption affirms that Mohammed is not in the picture and that other Islamic leaders (including Ali) are indeed represented with a green turban. • Who is the green-turbanned man in all these images? • Do they all depict the same person, or do some of them depict Ali, and the others Mohammed? • Does anybody out there know Farsi (or Arabic) who is able to accurately translate the calligraphy in the second and fifth images? • Is anybody out there a scholar or expert on Shi’ite Islam who definitely knows the story behind these images? • And even if you don’t know Farsi and are not necessarily an expert, can you provide a link to any site with reliable-seeming information about these icons? 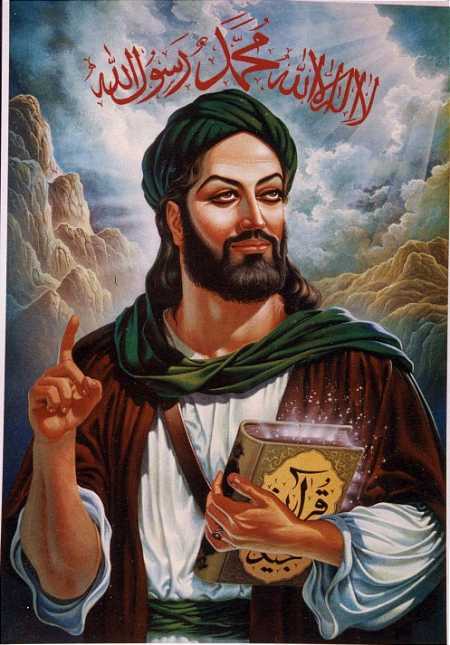 Be aware that the Internet is awash in misinformation, and that any identifying info about these images posted after 2006 could easily be in error, since many Western sites (including for a brief period, unfortunately, an early version of the Mohammed Image Archive itself) assumed these images were of Mohammed without ever actually verifying the assumption. I have traced the source of the purported identification of these figures as Mohammed to a 2006 article in the Danish newspaper Jyllands-Posten which itself linked to this authoritative-seeming Norwegian Web page hosted by the University of Bergen which states unequivocally that all the images above are indeed Mohammed. Based on this source, and this source only, the information richocheted around the world and has been repeated countless times. But is that Norwegian source accurate? How do we know? Post any and all links, information or personal expertise on this topic in the comments below. Updates will be made to this post if any reliable data emerges; and eventually the new info will be incorporated (along with credit to the discoverer) in the Mohammed Image Archive itself. At least some of these pictures are of Husayn ibn Ali, the 3rd Shia Imam. See the update to the original post, which answers all the questions I had asked.